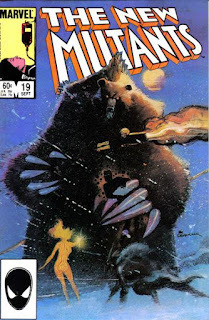 Thought there's technically still one more New Mutants issue to review (the series' seventh annual), it seems as good a time as any to look back on the series that was, starting with some overall thoughts and then delving into some specific favorites. Please sounds off with some of your personal favorites in the comments (and I'm planning on doing a similar retrospect for the original iteration of X-Factor in a few months' time)! On the one hand, New Mutants can be considered something of a failure. Intended to fill a specific void in the world of the X-Men, it launched with a very clear mandate to tell stories about kids with superpowers who weren't, first and foremost, superheroes. But it was a mandate doomed to failure by the needs of the genre and its role as a spinoff of a tremendously popular (and big selling) action-adventure series. As noble as series creators Chris Claremont and Bob McLeod's intentions may have been, before long, the New Mutants were fighting super-villains and getting caught up in tremendous adventures. When Louise Simonson took over the series from Claremont, she and her initial collaborator Bret Blevins did so with an additional mandate to make the characters act more like teens, to, seemingly, return the series to its original concept. At times, they succeeded. At other times, they went too far, portraying the kids not as teens, but as petulant eight-year-olds. And for the most part, they remained superheroes first, students second. By the time the book was cancelled, most of the original characters were gone, and everyone left was fully positioned to act as the kind of "in-your-face" superheroes the 90s seemed to demand, the concept of anyone in the series learning anything long gone. On the other hand, New Mutants was a resounding success. It proved that the X-Men could sustain a spin-off, opening the door to an entire franchise of mutant-related books and even additional X-Men titles. Claremont's all-too-brief collaboration with artist Bill Sienkiewicz garnered the series critical acclaim, still to this day. 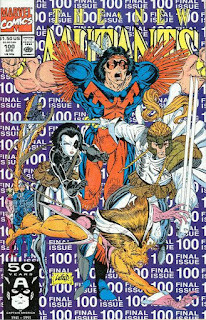 While it was technically cancelled at the one hundred issue mark, it's sales were always high, and it effectively lived on as X-Force, a series which ran for an additional 129 issues (and remains, along with "New Mutants" itself, a title that Marvel routinely trots out for new series), the first issue of which, for a time, was the highest selling comic book of all time. In Rob Liefeld, it launched the career of one of the 90s' biggest artists and one of the industries most infamous creators. In Cable, it launched a character who has headlined multiple series since his inception, and in Deadpool, it launched arguably Marvel's most popular solo character, in terms of sales and fan fervor, of today. Even beyond Cable, Deadpool and Rob Liefeld (almost a character himself at this point), the series introduced a number of new everlasting characters, characters who have remained a continued presence in both the various permutations of New Mutants/X-Force as well as other X-books and the Marvel Universe as a whole. Cannonball eventually joined the X-Men. Both he and Sunspot are Avengers, as well. 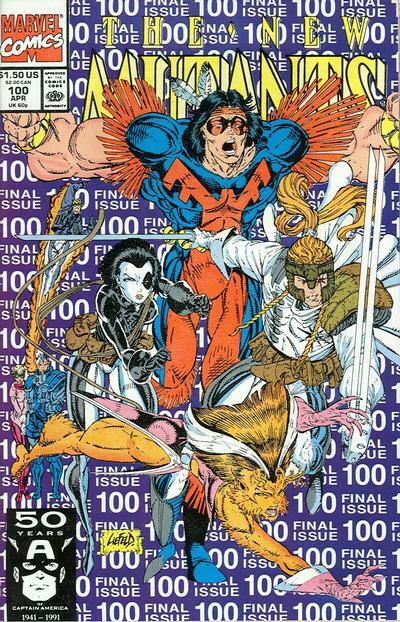 Wolfsbane became as much a part of X-Factor (as well, for a time, Excalibur) as the New Mutants. Illyana, who eventually came back into the X-books to suffer one of the series most poignant deaths, then came back from the dead but older again, has been a fixture in one X-book or another since her return. 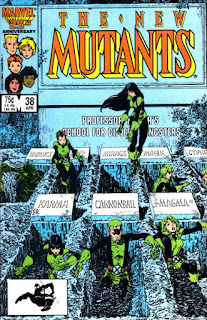 New Mutants never quite managed to achieve its intended goal; few series that try to position characters as students first rarely do. But it nevertheless succeeded in expanding the world of the X-Men and creating new, memorable and lasting characters for that world (to the point that, even today, I tend to think of them more by their real names - Sam, Dani, Rahne, etc. - than I do their codenames, in a way I don't even with some of the most longstanding X-Men). The series' relatively short run (for the time) and its status as the incubator of Rob Liefeld tend to overshadow its legitimate successes and obscure it's legacy. But it deserves to be remembered for what is is: first, in numerous ways, among the X-Men spin-offs. The Hellions (yes, technically a group of characters and not just one) are easily the New Mutants' best antagonists because they speak so directly to the book's "students first!" approach while still acknowledging the conventions of the genre. As much a group of students from a rival school as a team of budding super-villains, confrontations between the two groups always gained something from the fact that members on both sides probably would have benefited from switching teams, highlighting the fact that while their respective mentors may have been enemies, the kids themselves aren't too far apart. The Hellions were used far too sparingly in the course of the series - less Spyder & Gossamyr, more Hellions! - and then mostly killed off shortly after New Mutants wraps, but perhaps that sparse usage helps their appeal. Poor Dead Doug. He's cool (and memorable) because he's the one mutant with an uncool, flashy power, albeit one with potential for great power when used in non-conventional ways. Claremont tapped into that a bit before he left the book (such as Doug's ability to understand Lila's Dyson sphere, or read body language at the poker table), but unfortunately, Weezie decided to call many fans' bluffs and kill him off before his full potential was realized (and then Weezie left the series/the series left itself before she could execute her plan for bringing him back). Which is a shame, because the X-books can always benefit from more characters who can do more than just blast, punch or slash at stuff. Known for being nigh invulnerable while blastin', I love me my straight-laced leader types, and Sam is probably the squarest such type after Cyclops. He's also the somewhat surprising backbone of New Mutants, there from the beginning, there until the end, developing strong and varied relationships (friendly, brotherly, romantic) with several characters along the way. 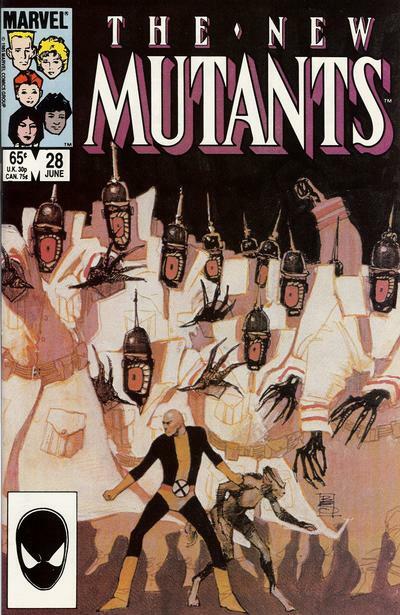 Plus, the development of his mutant abilities, from its initial out-of-control raw power to his ability to fly stealthily and expand his blast shield like a force field at the end, makes the strongest case for New Mutants as a series where the characters actually do learn to control their powers over time. You can't love Claremont and not love at least some of his ridiculously-powerful and well-developed female characters. But unlike Dani, who lost a little something once Claremont left the series, Illyana remained a central figure in the book under Simonson, her struggle to control both her darker side and her demonic kingdom remaining a running thread throughout the series before it all blew up in "Inferno". A rare comic book character who received something of an ending to her story arc (at least in the pages of New Mutants), Illyana's journey from freaky outsider to coolly-efficient badass to overwhelmed powerhouse to, finally, noble sacrifice really is the central arc of New Mutants from her first appearance in the series through her last. Coming to New Mutants first from X-Force, Cannonball was, initially, my touchstone character. Of the original X-Force crew, he was the one who received the biggest character arc (at the time of my reading) and, Sam having been there since the beginning and sticking around to the end, I very much read New Mutants from the perspective of him being its central character my first time through. But as I got older, as X-Force became less and less relevant, it became more and more clear that Sam, while a solid, reliable character, was never intended to be the main character of the series. Instead, that role belongs to his ostensible co-leader, Dani Moonstar (ostensible because really, Dani is the team leader and Sam just pitches in when she can't). Reading these issues again for X-aminations in particular underlined just how much Dani is Claremont's favorite character and his go-to POV character throughout his tenure on the book, and it's hard not to be infected by his enthusiasm for her. While her power is, from the beginning, deeply nebulous (and by the time Simonson is done with her, patently ridiculous) her characterization more than makes up for it. Also, aside from probably Illyana (and maybe Rahne), she experiences the biggest character arc over the course of her tenure, going from a bratty teen distrustful of authority (because she's just an angsty teen) to someone cautiously willing to accept authority at the same time that she finally receives some herself, from a reluctant leader to an accomplished one, from something of a loner to the glue that holds the group together. It's telling that Dani leaves right before Cable arrives; the two characters could hardly have co-existed without blowing up the series (Dani's return in X-Force, not surprisingly, also coincides with a prolonged Cable absence), and Dani was simply a far too nuanced character to work with the book's new, Liefeld-inspired aesthetic. 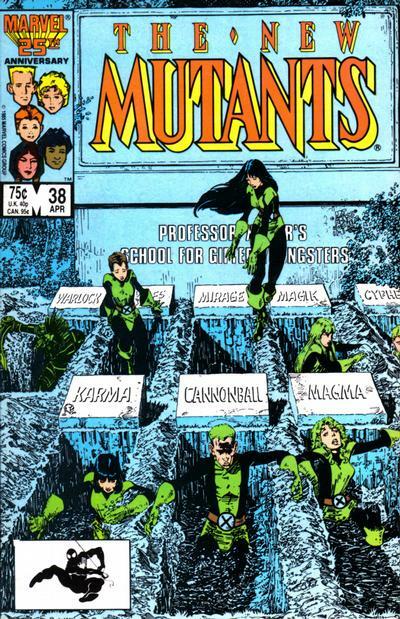 New Mutants outlasted Dani, and eventually, Dani would return, outside its pages. But New Mutants, especially Claremont's New Mutants, really is her series. Somewhat surprisingly, the New Mutants ended up fighting Freedom Force a lot - after the events of "Fall of the Mutants", before and during their second Asgardian adventure, and then via Cable during his debut storyline. The teal background on this one is pretty bad, but otherwise, it's a strong action-orientated cover that uses the massive Blob as a pivot point around which all the other characters turn (I also really like the perspective work, with Stonewall's fist coming out at the reader. And I'm a sucker for Freedom Force). Simple and effective. 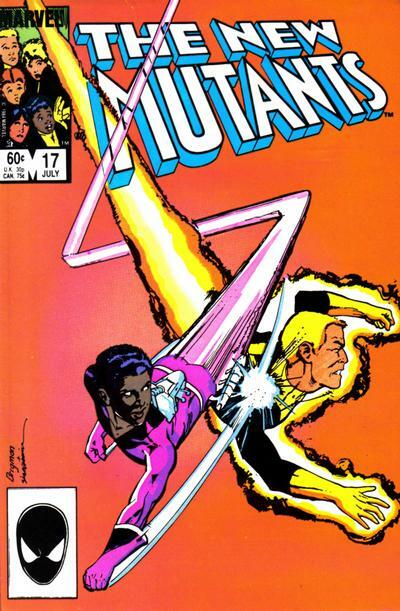 The blast streams draw the eyes from the logo to the two central figures, poised in mid-action, while the corner box is used to make the central image look bigger and inject a little character into the cover. Sienkiewicz's first cover, for issue #18, usually gets singled out, but I like this one better. It's a team shot (#18 only features Dani) is a little more action-packed, and really sells the idea of the Demon Bear as this huge, monstrous thing. Along similar lines as the classic cover to X-Men #141, this a a creepy, macabre, attention grabbing image, the kind of thing that would catch the eye of a potential buyer and motivate a pick up. But it also teases the story inside, right down to Dani's role as the one member of the team who wasn't killed by the Beyonder. The best of Sienkiewicz's many strong covers. Others might prefer his more abstract stuff, but like the cover to #19, this one strikes the right balance between the surreal and the straightforward, contrasting the smooth, polished figures of Professor X (wearing a New Mutants uniform!) and Wolfsbane with the more jagged, twisted soldiers above them, thus representing both the scale (massive) and style (chaotic) of the threat facing the characters inside the issue. As with issue #17, image also leads the eyes from the logo to the figures, with the cover roughly divided into three pieces (the logo and black background, the soldiers, the heroes) that all come together to form one strong, central image. The best of the various New Mutants/Hellions clashes (and the last regular Claremont-penned issue), this issue finds the two teams competing in a way that isn't that far removed from what two non-superpowered rival schools would do, and thus, is the best use of the two team's antagonism for each other. It also features a number of strong character moments from members of both teams. Yes, Kitty's speech at the end is a bit heavy-handed, and it's a shame one of the book's regular cast couldn't have given it (especially since Kitty was on a bit of tear when it came to making heavy-handed speeches around this time) but this is nevertheless a gut-punch of an issue, one that highlights the central metaphor at the heart of the X-books, as well as both the price of intolerance and the power of comics in highlighting that price. Arguably the best use of Reformed Magneto in the series, as he takes on a pretty stacked Avengers lineup (who still think he's an out-and-out bad guy) in order to rescue his students, who have been ensnared by the White Queen. Magneto is desperate to get to the New Mutants but also unwilling to cause legitimate harm to the Avengers, and that tension makes this issue standout. While this issue does little to further the themes of New Mutants, it's nevertheless a gorgeously illustrated, character-driven issue in which every member of the team gets time in the spotlight. But most of all, it's simply a lot of fun. If issue #45 highlights the ability of comics to teach and inspire, this one highlights comics' ability to be grinning-ear-to-ear entertaining. This is probably the best example of what New Mutants wanted to be as a series. A done-in-one story, it features a fairly straight-forward slumber party involving the female New Mutants and some girls from the local school alongside plenty of action and super-power usage (albeit none of it in the service of a traditional super-hero/super-villain confrontation), while also introducing both Warlock and Doug to the team (and thus filling out the series' most classic roster of characters). Occurring in the midst of Bill Sienkiewicz's run on the series, his surrealistic style pairs nicely with the relatively mundane setting, bringing energy and excitement even when the action is as low key as slumber party shenanigans. It's doubtful that a comic book series in the mid 80s could do this sort of thing regularly (or do it regularly while doing it this well), but this issue stands as a shining example of the series at its best. 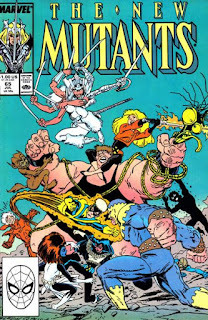 For me, NEW MUTANTS has never meant much. I came to the X-Universe a few years after it ended. I never read X-FORCE except when it participated in crossovers, so even the NM characters who carried over were pretty much unknown to me. The only NM back issues I ever picked up were those relating to crossovers, such as "Inferno". It wasn't until within the past decade that I really gave the series a try, via the NEW MUTANTS CLASSIC trade paperback series and the various hardcover collections (as of now, there are only a dozen issues of NM not reprinted by Marvel). As you're doubtless aware, my tastes tend to lean toward classic, traditional, non-experimental superhero comics. So when I read all those old NM issues, I found that my favorite chunk was the earliest stuff, from the graphic novel up through the Nova Roma saga. Claremont, McLeod, Buscema... Xavier as their teacher, no Magneto, no Cable... no Warlock... that was the stuff I liked best, and the original lineup is my favorite. I also would have originally cited Cannonball as my favorite New Mutant based on my limited exposure, but having actually read all those issues, I would now call Mirage and Sunspot my faves -- the former due mostly to her characterization and the latter due mostly to his visual. I don't think I could list any favorite issues or stories, though. 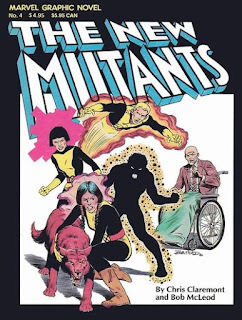 Important as they were, and to some extent remain, to the X-Men's mythos, for me the New Mutants are still pretty much just a footnote in the franchise's history. Which, I'm sure comes as no shock to you, is probably my least favorite stretch of the series. Though I think it less to do with the lack of narrative or artistic experimentation and more that the later stuff seems more developed and fleshed out, more what I think of when I think of "New Mutants". My favorite stretch of issues is, probably, #35-54. The art's not flashy but its solid and dependable, Magneto hasn't yet become the raving lunatic he will under Simonson, there's a nice mix of serialized stories and done-in-ones, including appearances from the Hellions, and the series probably makes the most of its SECRET WARS II tie-in the best of any of the books involved in that nightmare. Although I grew up around the CC-JRjr era, I barely gave the New Mutants much interest aside from the occasional issues we had (1-2, 5, 21, and 33). Near the end of the century, I began collecting comics again, and among them concerned the adventures of Illyana, the bad girl trying to be good with a smartbutt attitude. I even sculpted a statue of the character (structured from a clay statue of Wolverine). Liking her led to liking the group. For the turn of the century, the New Mutants were my favorite comic-book group. The group of teenagers-as-mutants, in a SCOOBY DOO-BH 90210 way, full of teen fun & angst, weird adventures, and witticisms. As my interest in Japanese Animation also grew, the two mixed. They were my fanfiction group (specifically the dream team 9) in crossovers. A Tenchi Muyo-New Mutants crossover! A Tenchi-NM-Trigun crossover! A Tenchi-NM-Dragon Ball Z crossover! To this day, I toy with several crossovers having the novice group in the worlds of FULLMETAL ALCHEMIST and NARUTO (it's rather easy when you have a dimensional teleporter in your cast). My favorite storylines were the Hellions/Kitty rescue, the Demon Bear-Warlock, the Legion, the Asgard, 45 and 52. I pretty much liked them all. The group of teenagers-as-mutants, in a SCOOBY DOO-BH 90210 way, full of teen fun & angst, weird adventures, and witticisms. I definitely think my love of stuff like 90210 informs my appreciation for series like these (and all the subsequent student-focused series). 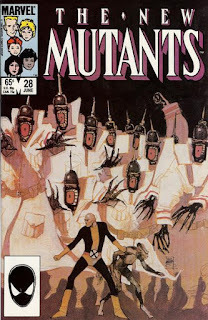 It boggles my mind that no one has yet to try a New Mutants (or some approximation thereof) TV series. I don't even need specific characters or story beats recreated; a "90210 with super-powers" show could easily become a favorite. New Mutants was always a fun book for me, but never as important as X-Men or even X-Factor. I only really discovered the books in 2001 when I was 16 after I read a huge portion of X-Force and wanted to see where they started. At the time I dug the concept of the NM - Being a teenager myself, I could really relate to the characters. I'll never forget that while in the middle of reading the entire run I helped my Grandma move. The move was so monotonous and straining on my lanky body that I began imagining myself having Sunspot's powers so that I could lift the furniture with ease and get out of there faster. This was also significant in that this was probably the last time I actively had a Doug Funnie-esque fantasy about myself being something fantastical. Personally I use telekinesis. On our local sniffer-loops using traffic light too. The space ape man shooting blast on Illyana's face with his pleasure gun! Ahem. 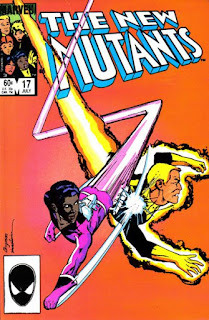 I only got to read the Claremont run of NM just recently, because barring #50, the Asgard Special and the Mojo Wildways Annual #2 our publisher was very sparing with pure NM material, but I have still since always been very partial to the New Mutants due to their appearances in JRjr era UNCANNY and in the Annuals. It may even be that they were stealing a show a bit there for me precisely because of I having no access to their own adventures and them being very obviously very developed Claremont characters. The Hellion massacre to amp up the threat of a crappy post-Claremont villain is pretty much the most egregious thing in comics for me, because even as I never got to read most of them at all, what little I did catch of some of them in UNCANNY #193 seriously made me want more. I have opinions about other media shenanigans making their way into the comics Universe, but little Angelica Jones introduced in that story stands as a shining exception. It may even be that they were stealing a show a bit there for me precisely because of I having no access to their own adventures and them being very obviously very developed Claremont characters. I definitely encountered most of the classic New Mutants characters first in those Paul Smith/JRjr UNCANNY issues, which is another reason why I like that era so much. Lots of interesting background info, with regards to what we ended up seeing and what we didn't see, with regards to dropped and changed plots. And the genesis of the series itself is interesting, since CC and Weezie more or less chose this concept to avoid having someone else do “X-Men West". Its a good read, and a nice companion piece to Teebore's analysis of the title. Not much to add to Teebore's analysis, except of the larger legacies this title gave the franchise wasn't just the characters themselves, but the concept of the title itself: the idea of a younger junior team in training. Whether its Generation X, the New Mutants/New X-men, Young X-men, Generation Hope, Wolverine & The X-men...Marvel will always come back to this concept whenever it can and try to make it work. Heck, you could argue the current All-New X-Men title fits that bill, even if they aren't being trained in a mansion; it is still the younger generation team book. As for this series? When it was good, it was actually pretty good. When it was bad, it was really bad. But it does have historical context as Teebore pointed out, which always makes it worth looking back on. the larger legacies this title gave the franchise wasn't just the characters themselves, but the concept of the title itself: the idea of a younger junior team in training. Shoot, that's a great point, something I really should have emphasized - as much as NEW MUTANTS lives on in X-FORCE, it will, before long, also live on in GENERATION X, and then NEW X-MEN, etc. While it'll be awhile before we get another series titled "New Mutants", as you say, the idea behind the series never really goes away (at least not for long), and continues in one form or another to this day. (In part, I'd argue, because nobody has yet to really want to or be able to commit fully to the idea of characters as students before superheroes. The DeFillips/Weir & Kyle/Yost NEW X-MEN has probably come the closest, but then that got all hosed up by Decimation). I’m glad I stopped picking up New Mutants when I did, one issue after Sienkiewicz left. Although it’s entirely possible (even likely) that I’m forgetting something, I can't say there were more than a couple of issues that I was really happy to read for this project — edification for history's sake notwithstanding — apart from those early days and a couple others I'd grabbed off the racks purely for the covers: #40 and #51, both of which ironically barely have anything that says “New Mutants” about them apart from the logo. My favorite issues are #21 (“Slumber Party”) and Special Edition #1, same as yours. After that I’d probably rank #18-20 (“Demon Bear” saga) and, if you don’t count those three individually, then I guess for variety #40 (“Avengers Assemble!”) and #51 (“Teachers’ Choice”) if just for the Nowlan art despite how garish the colors are under the era’s Flexographic printing; besides the earliest Claremont/McLeod stuff, Claremont/Sienkiewicz, and maybe some Claremont/Buscema for nostalgia, however, I range between not caring much and being outright hostile to the lack of quality. My favorite covers, taking pains to spread the wealth, are #19 by Sienkiewicz, #40 by Windsor-Smith, #4 by McLeod, #51 by Nowlan, and #17 by Brigman with Sienkiewicz inks. The painted Sienkiewicz work is mostly great across the board and the Windsor-Smith ones are pretty nice too. My favorite characters are probably Dani, Illyana, Sam, Roberto, and Warlock, the latter two largely for the visuals, although back in the day I had a soft spot for Rahne as the one I was most likely to hit it off with personally. The painted Sienkiewicz work is mostly great across the board and the Windsor-Smith ones are pretty nice too. I really should have included at least one of the BWS covers - they are, as you say, pretty nice across the board. I had a hard time singling one out, since they were all pretty much on a similar level. the latter two largely for the visuals, although back in the day I had a soft spot for Rahne as the one I was most likely to hit it off with personally. Both Rahne and Warlock came very close to making my list. I know a lot of fans dislike the latter, but I think he works very well for this series. I wouldn't necessarily want to see him in, say, X-Men or X-Force, but for this series at this time, he brought something unique to the table. And Rahne is one of those characters who received a surprising amount of development over her time in the series that always seemed to come about quietly. There was no big "Dark Rahne" storyline or anything that triggered a jump her development or change in characterization, but the Rahne of issue #1 is vastly different from the Rahne who went into "X-Tinction Agenda" (which of course spit out an entirely new and manufactured Rahne), even while remaining consistent throughout. Much obliged. Had you not mentioned that a retrospective was also coming up for X-Factor as we knew it, since New Mutants is really the first time a series you’re covering has outright ended, I might not’ve wondered about whether there’d been one for X-Men on the cusp of the reprint years before Giant-Size #1; whether you should do one for Claremont’s run, I don’t think I can properly advise you. Don’t worry about consistency, though, since it’s not like you put up retrospectives when various artists left aside from whatever was in the posts on their final issues, nor when Stan Lee handed over the reins to Roy Thomas. X-aminations in January 2016...and Beyond!